Today, Raymond Weil has announced the introduction a new addition to its Maestro collection, the new Maestro Chronograph 4830, with an automatic movement in a polished stainless steel rose gold PVD plated case, powered by the RW7230 automatic movement. For more details about this elegant watch, see below the press release and technical specifications. 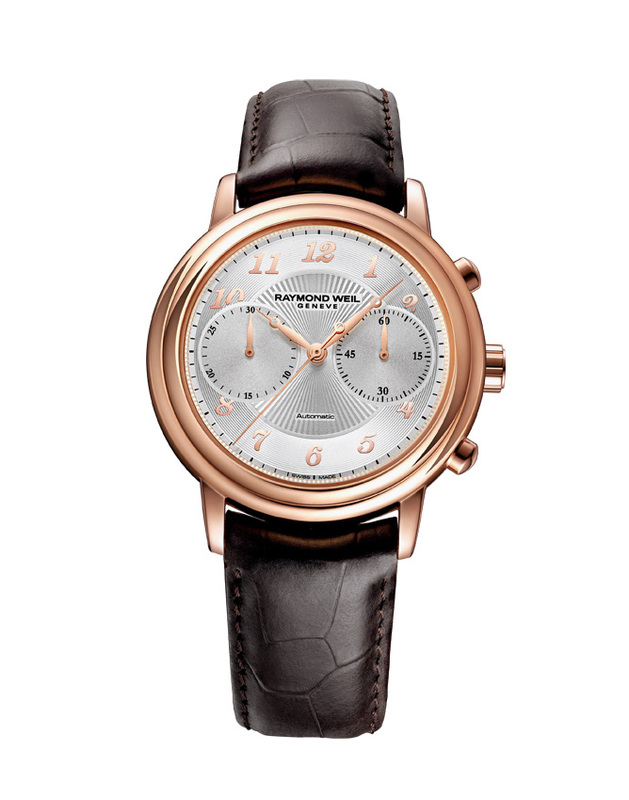 The maestro chronograph, first presented in 2011, plays a melody around a more contemporary chord arrangement this year. On a silver dial, the hours are now depicted by Arabic numerals, leaving place in the center for a refined sunray guilloché decoration. The chronograph’s counters, located at 3 and 9 o’clock, read off horizontally. The hands, which recall the classic character of the collection, are rose gold plated, matching the hour numerals and the 41mm diameter case. Finally a classic, brown, alligator-style bracelet with an ardillon buckle confers all the letters of nobility upon this fine example of masculine, automatic watchmaking. Distinction and refinement give this chronograph a prominent role in the maestro collection.